An observer of street art would probably think the artist prefers a freshly painted new wall as a canvas, with no other artwork around. Rendered walls with a high-sheen surface are by far the hardest to work with wheatpaste, and a new wall has no atmosphere. Enter the Marion Council Depot wall. Although this wall has no surrounding graffiti, it ticks all the boxes for texture, grunge and atmosphere. It even has an old vine of some sort growing through the cracks in the wall. 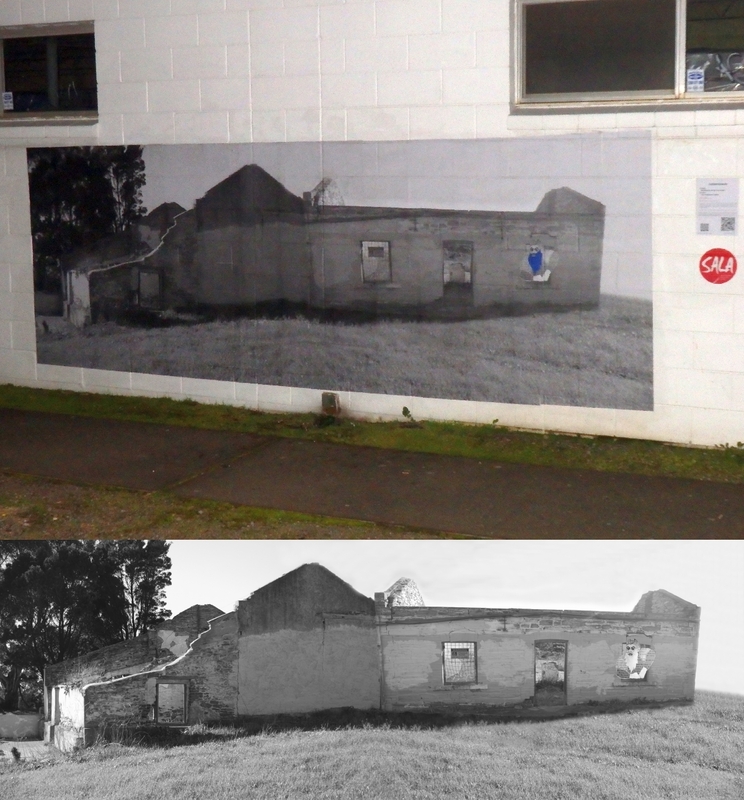 The lack of existing artwork was overcome by including a graffiti covered building at Marino. 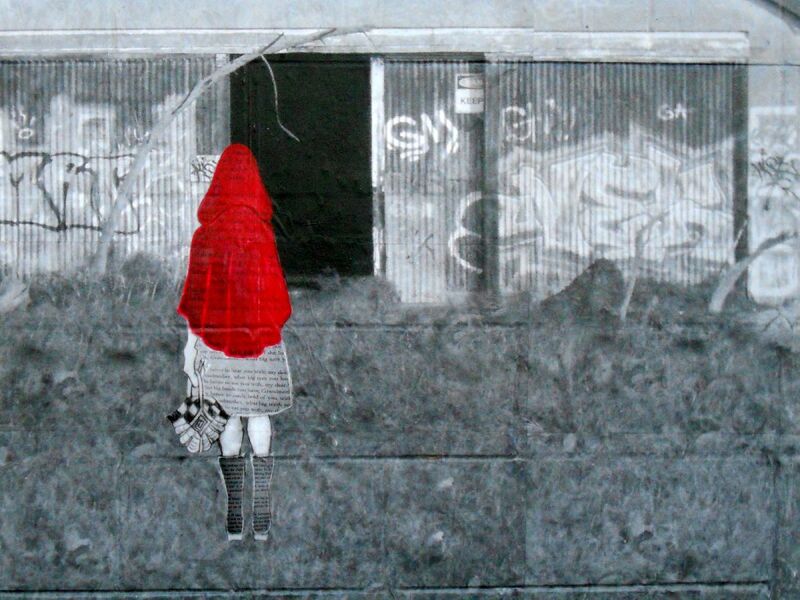 Why is Red Riding Hood approaching this darkened, abandoned building? On closer inspection, she isn’t what she seems; morphing into a cross between the wolf, Nosferatu and Sadako. So what’s in her picnic basket, Grandma? When we started working on the Subterranean exhibition, the emergence of European fairy tale characters warping and changing the local landscape was a metaphor for the impact of white colonisation on the Australian environment. 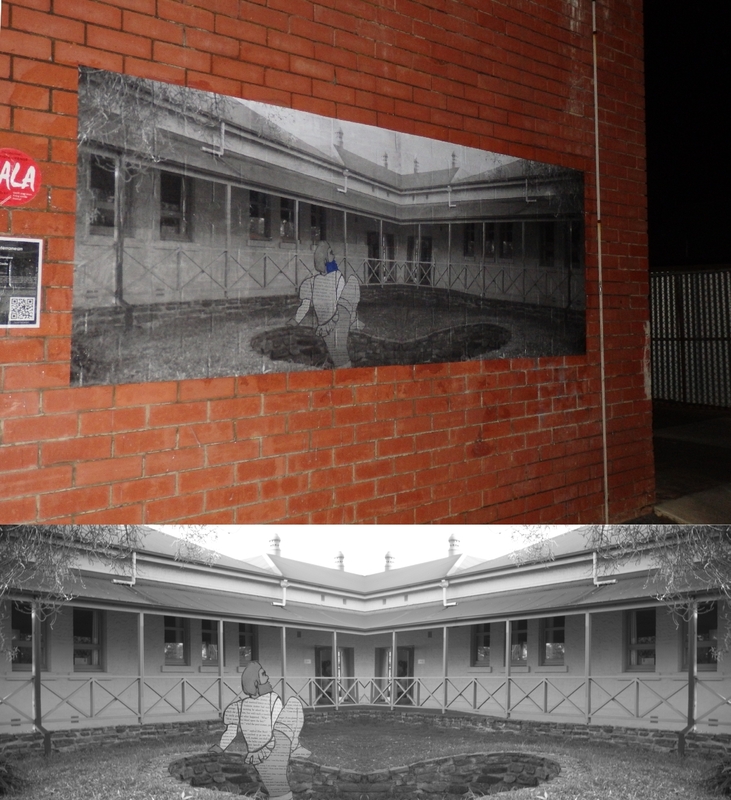 As the work progressed, specific stories matched the menace of the surroundings, such as Bluebeard at the old Glandore Boys Home. 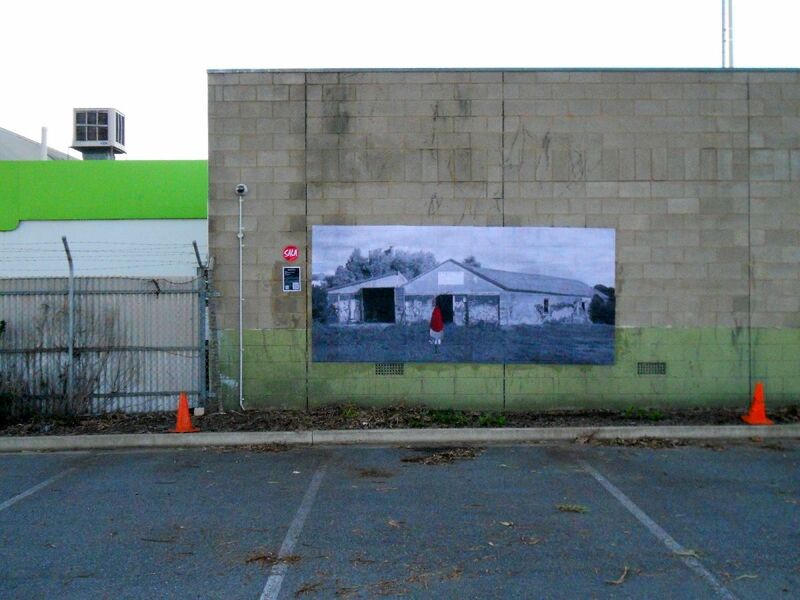 With the national investigation of child abuse in institutions, the personification of domestic violence is an ominous presence as he climbs into the grounds of what is now a community centre, blurring the past with the present. A month ago the story broke of contaminated groundwater near the old Mitsubishi factory in the Marion Council District. Vapour from the contamination was working its way through the walls of buildings in the area. The poisonous presence of Bluebeard climbing through the window of the old Pea Farm Ruins after emerging from under the ground takes on new meaning. The Subterranean SALA Exhibition merges European fairy tales with the local environment, causing the surrounds to warp and change. Some of the murals feature the same characters. Here is a day in the life of the Seven Dwarfs, while Snow White is left alone with her wicked step-mother… accompanying electronic sound pieces by chalkwhitehands include A Quality of Strangeness and Dark Significance. The Dwarfs begin their day at Patritti Wines and Cellar Door, buying supplies for lunch. They continue to the Oaklands Park Railway Station, to catch a train to the southern suburbs. The Seven Dwarfs then walk to work at the Worthing Mine. The Worthing Mine ruins are on private property but can be viewed from Brooklyn Drive at Hallett Cove. Thanks to the Marion Historical Society and Marion Heritage Research Centre for their kind assistance. Map of mural locations here. For the SALA (South Australian Living Artists) Festival this August, Andrew and I are working on noise murals for the streets of Adelaide. Or rather it started out that way. 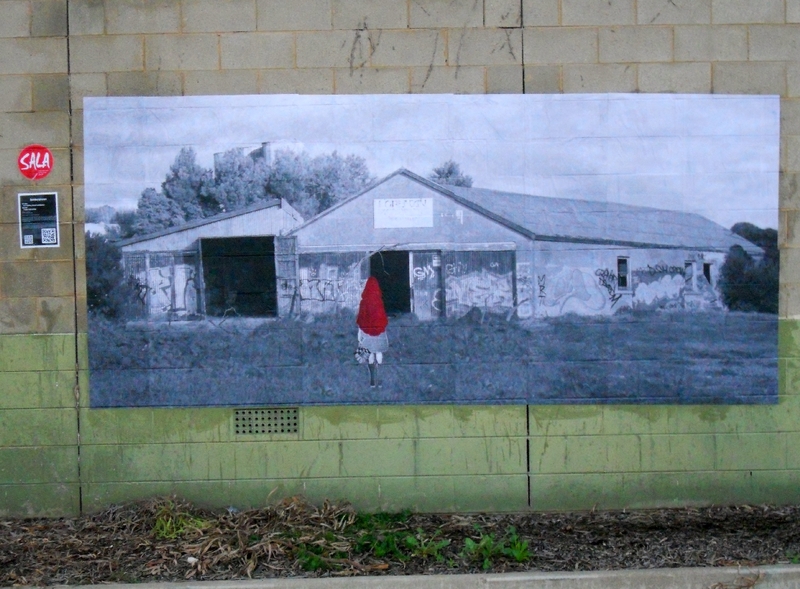 The original intention was to paste up photo-montage murals on random walls around the Adelaide CBD and suburbs, but an intervention cut the idea short. We were lucky to drift in the direction of the Marion Council district and are now working exclusively on murals of historic and interesting architecture and surrounds in that area. At each mural will be a QR code than can be scanned by the QR App on a smartphone, which will take the view/listener to the ambient sound. We will be listing the locations of the murals when they are all up, hopefully by the beginning of the Festival! 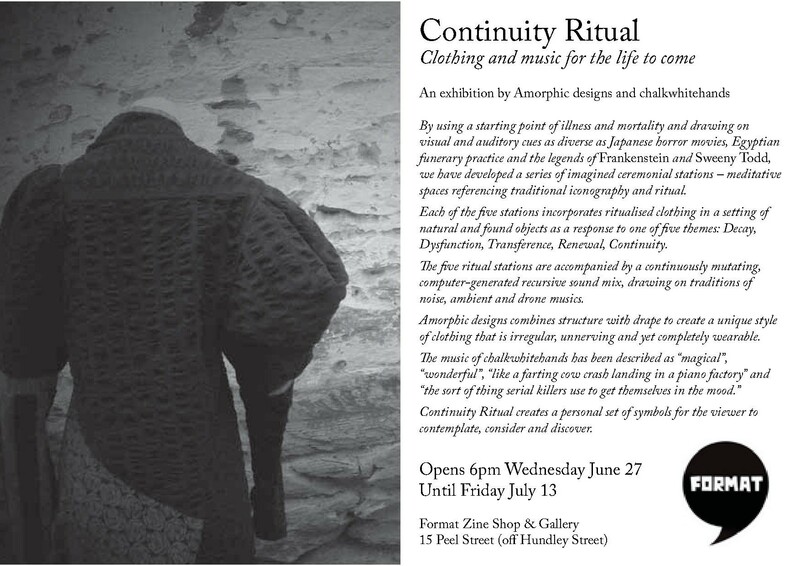 Our exhibition Continuity Ritual opens at Format Collective on Wednesday 27th June at 6pm, 2012. Everyone is invited so if you live or know anyone who lives in the Adelaide area please pass it on! We will create an online version of the exhibition once it’s set up with images and sound. Continuity Ritual exhibition invitation pdf.